Organize your smallest, most valuable essentials elegantly and efficiently in the Rogue Wallets RFID Weekender Wallet. 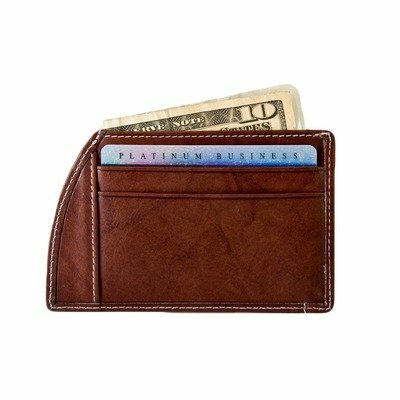 This soft, smooth, supple, and luxurious leather men's wallet features an angled design and bright, contrast stitching, and it's available in several colors. It features a clear exterior ID window on one side and credit card slots on the other, and the Rogue Wallets RFID Weekender Wallet boasts RFID-blocking technology, and it effectively denies potential hackers and identity thieves access to your personal and financial information, which is stored on chips now embedded in US passports, driver's licenses, and debit and credit cards. Don't get scammed! A new form of pickpocket has appeared on the scene, and you don't even need to be physically touched to lose your valuables. Crooks now can electronically scan your credit and ATM cards, while they are still in your wallet or purse, without you ever knowing about it. Unless you have a RFID-Blocking wallet, that blocks the signal from leaving your wallet. Dimensions: 4 3/4" X 3 3/8"